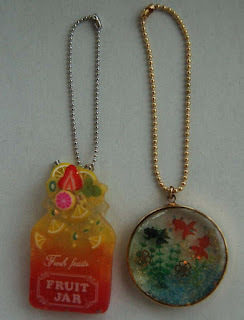 I thought you's be interested to see the resin charms I've made using the kits sold at HM Ben Franklin Crafts. First off, I love the resin kits because they have EVERYTHING you need to complete the project except for the resin and UV lamp (plus some toothpicks and parchment paper). The Fruit Jar charm was made with the new resin designed to work well in silicon molds. 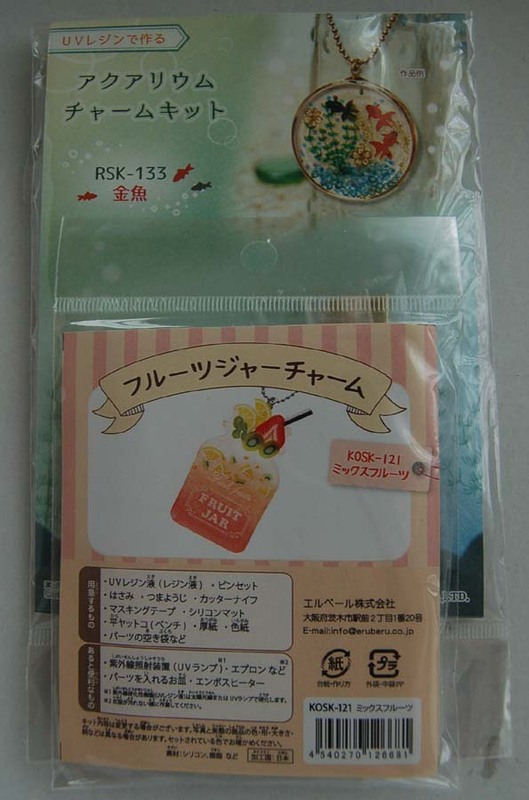 Even though this kit did not have English directions, I was able to put the charm together fairly easily. (I have made a few kits previously so I do know the general steps.) I ended up with a few 'extra' fruits so I just piled them onto the jar. The goldfish charm did have English instructions so it was a snap to put this one together and it came out almost exactly like the one on the packaging...so proud! I may use these charms for purses or perhaps I will change out the ball chains and add 24" necklace chains and give them as unique jewelry gifts. What do you think? I think, if you try them, you too will get hooked on making resin charms. Give them a try for some crafting fun! I've always wanted to play with resin!